Preheat the oven to 400 degrees. Place the ginger, lemon zest and juice, oil, and salt and pepper to taste in a bowl, and mix well. 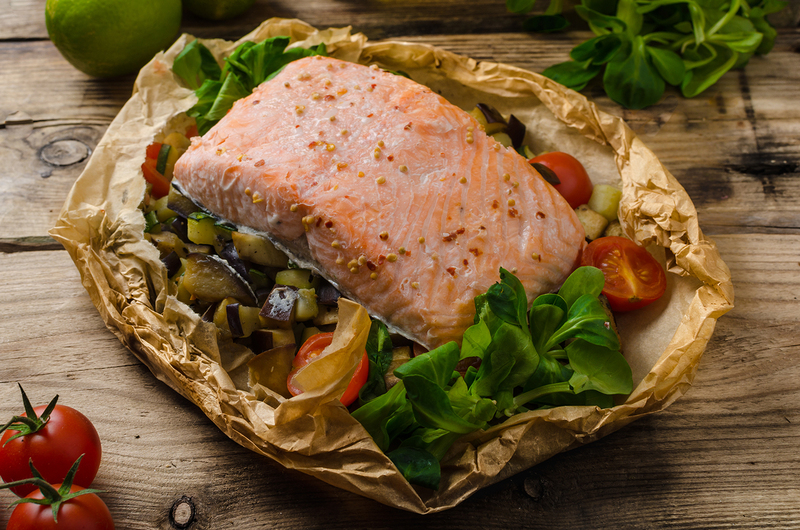 Cut 8 pieces of parchment paper (or aluminum foil) into squares large enough to cover each salmon steak and leave a 2-inch border all around. Put some fennel and a salmon steak in the center of a square and drizzle with the ginger-lemon mixture. Place the remaining parchment squares on top of the salmon and fold up the edges to form packets. Simply double folding each of the four sides is enough to seal each packet. Put the papillotes on a baking sheet, and bake in the preheated oven for 12 to 15 minutes. Set each papillote on a plate, and serve. literally “in case.” For me, it means planning ahead and bringing healthy snacks like nuts and dried fruit on the go, just in case you get hungry.